At the marriage feast of Cana, Jesus turns water set aside for washing, into wine of great quality. A new richness and abundance flows to the people from Jesus. We will partake of this richness if we, like the attendants at the wedding, follow Mary’s instruction to ‘do whatever he tells you’. This is the only command given by Mary which is recorded in the New Testament, and it is a prerequisite for miracles in our families. The Bible tells us how to do the will of God and effect salvific changes in our daily lives. Just as Jesus filled the empty water jars with wine, let us fill the empty hearts around us with love. 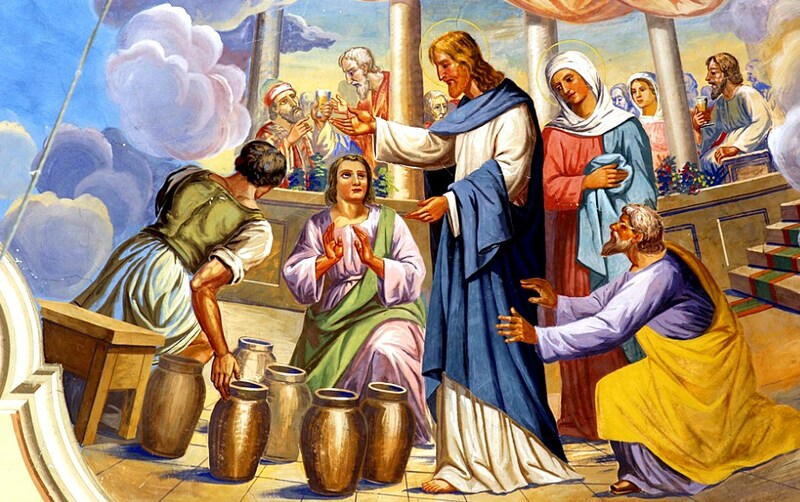 By the miracle of Cana, Jesus challenges us also to enrich the empty lives of those around us with the new wine of love, mercy, concern and care. Let us learn to appreciate the miracles of God’s providence in our lives. God, often as an uninvited guest in our families, works daily miracles in our lives by protecting us from physical and moral dangers, providing for our needs, inspiring us and strengthening us with His Holy Spirit. Let us also appreciate the miracle of the Real Presence of the Lord on the altar where God transforms our offering of bread and wine into the Body and Blood of Jesus. As we receive the gifts he offers we are transformed in turn into a new creation.